Type II Diabetic Patients’ Illness Perception and Self-care Behaviour: Does Comorbidity make any Difference? Murugesan, M., Sundaramoorthy, J. (2018). Type II Diabetic Patients’ Illness Perception and Self-care Behaviour: Does Comorbidity make any Difference?. International Journal of Behavioral Sciences, 12(3), 114-124. Manikandaprabu Murugesan; Jeyavel Sundaramoorthy. "Type II Diabetic Patients’ Illness Perception and Self-care Behaviour: Does Comorbidity make any Difference?". International Journal of Behavioral Sciences, 12, 3, 2018, 114-124. Murugesan, M., Sundaramoorthy, J. (2018). 'Type II Diabetic Patients’ Illness Perception and Self-care Behaviour: Does Comorbidity make any Difference? 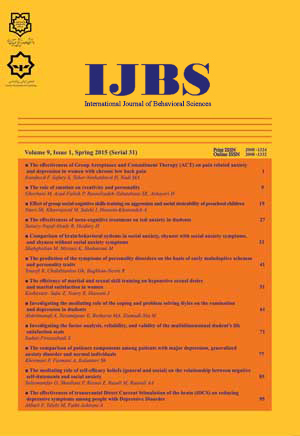 ', International Journal of Behavioral Sciences, 12(3), pp. 114-124. Murugesan, M., Sundaramoorthy, J. Type II Diabetic Patients’ Illness Perception and Self-care Behaviour: Does Comorbidity make any Difference?. International Journal of Behavioral Sciences, 2018; 12(3): 114-124. Introduction: Earlier studies have shown that illness perception and self-care behaviour change based on the existence of comorbidity / no comorbidity conditions. The present study investigates the role of comorbidity in Type II diabetic patients' level of personal control, treatment control, illness coherence and self-care behaviour in the Indian context. Method: A cross-sectional survey was conducted among (N=303) type II diabetic patients in southern India, of whom 43.56% reported having one comorbidity condition or more comorbid conditions. Participants’ illness perception has been assessed using Illness Perception Questionnaire-Revised (IPQ-R) and self-care behaviour has been assessed through Diabetic Self-Care Management Questionnaire (DSMQ). Results: Patients with no comorbid conditions had higher beliefs of personal control, treatment controland illness coherence, and also showed better self-behaviour than their counterparts. Patients with comorbidity conditions perceived diabetes as a chronic disease and seemed to have more consequences in their lives. They also tend to be emotionally affected and to have a lower belief of personal control, treatment control and illness coherence. Besides this, self-care behaviour was also found to be significantly different based on the patients' level of personal control, treatment control and illness coherence beliefs between diabetics who had comorbidity and those with no comorbidity conditions. Conclusion: Significant difference in self-care behaviour of patients with comorbidity indicates the necessity of interventions to enhance their self-care behaviour to manage their diabetes as well as their comorbid conditions.